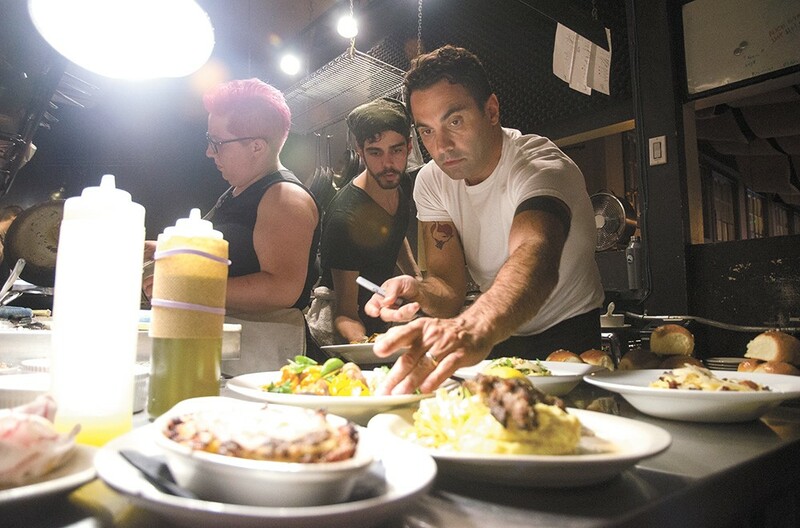 Chef Nick Pitsilionis has operated the Black Cypress in Pullman since 2009. We arrive in Pullman at the middle of the day, feeling a little hungry. We're not here for a game; there will be no tailgating on this trip. We're headed to a tasting menu at Pullman's fine dining restaurant, the Black Cypress, celebrating 10 hard-won years next summer. First, though, Black Cypress chef and owner Nick Pitsilionis meets us in downtown Moscow, fresh from the farmers market, where he's found some delicacies for the evening's menu. Pitsilionis has dark hair and an easy smile, both, I guess, inherited from his Greece-born family who've made their home in Alaska for many years. Pitsilionis takes us to lunch at Moscow's Maialina Pizzeria Napoletana, chatting all the way about the best restaurants the Palouse has to offer. He greets the servers and hosts and we order a bounty of food. It's easy to see that this is a tight-knit restaurant community. Just down the block is Nectar, a restaurant owned by friends where Pitsilionis returned to the kitchen after growing up in his family's restaurant business and working for a year at esteemed Napa Valley restaurant the French Laundry. Pitsilionis set out on his own and opened the Black Cypress in August 2009. Pitsilionis is humble, far more interested in giving me the area's lay of the land than talking about his own background or food. I mention I've started cooking with avocado oil, and he tells me that he's learned how to extract the secrets of cooking with olive oil. "It does something different when you cook it longer," he says. "I always add oil at the beginning and at the end to draw out those complexities of flavor." Already, my mouth is watering, thinking of what he has in store for us tonight, but he's not telling. We arrive at the Black Cypress for cocktail hour and a chat with bar manager Lars Lunstrum. His passion and travels have helped make it a world class cocktail destination in the middle of the wheat fields. He offers a sophisticated twist on an old fashioned, a perfect showcase of the balanced, serious drinks Black Cypress is known for. Dinner begins with a crisp glass of white wine before Pitsilionis brings us a melange of squash, fresh from that day's market and each prepared in a different way. "It's like someone dared him to make squash as many ways as he could," says my guest, and that's not far from the mark. The patty pan squash is grilled to a charred finish, topped with lightly deep fried zucchini. There are two kinds of pickled preparations, and everything sits atop a fresh, chunky pesto. We eat as though there are no more courses. When Pitsilionis brings out the moussaka, he apologizes. It's too big, and doesn't really belong in fine dining. This is the sort of thing your Greek mother would cook at home. It's almost the Greek lasagna equivalent. One bite in, and I know there won't be leftovers. The meat sauce is thick and well spiced, but not overwhelmingly so, and the eggplant melts completely away on my tongue. The entire thing is covered with a creamy béchamel which almost functions as a cheese. It tastes like home, but accessed in another language. The main course is perfectly cooked lamb, a meat Black Cypress is known for. Often, Pitsilionis sources lamb from New Zealand, but today it's from Yakima. He's tenderized it by soaking it in yogurt overnight. To celebrate the region, he's made a wheat-berry salad with fresh mint and parsley and citrus. He's added a funky cilantro to his tzatziki. At each course, Lunstrum brings either a splash of wine or a sip of a cocktail to complement the course. When we're finished with the lamb, he brings a spiced sherry cocktail and we wait for dessert. It's a raspberry panna cotta with white raspberries fresh from the market. The whole thing is drenched in a puddle of tart coulis. We finish our meal with sparkling wine. 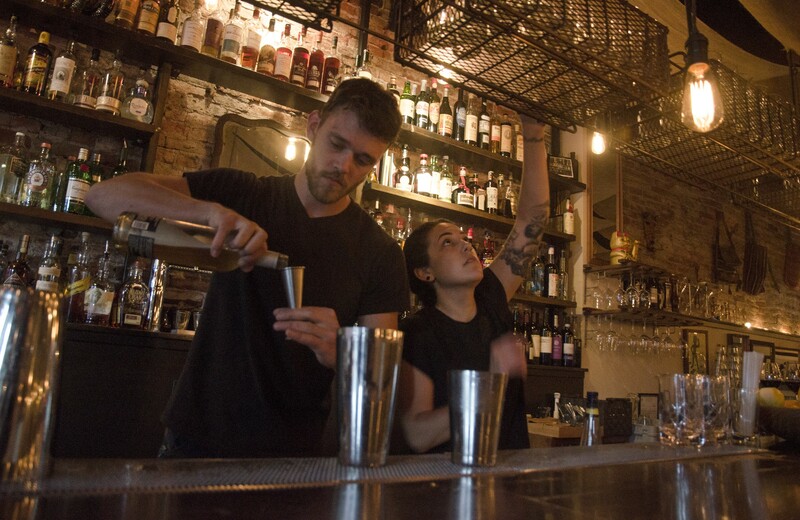 Bartenders Lars Lunstrom and Ariana Barela mix drinks on a recent Thursday evening at the Black Cypress. This may not be the experience most people expect when they drive to Pullman. Though every night doesn't include a tasting menu, Pitsilionis and his crew always serve excellently prepared seasonal and detail-oriented food with a high level of service. In a business where many don't last a year, this small town gem has almost made it a decade. That success, of course, isn't without its challenges. Pitsilionis' clientele are largely locals, and in this small college community, many aren't in a position to make fine dining a regular part of their lives. When big events like graduation and parents weekends come, the restaurant is flooded. The college community is also one of constant transition. It takes time to cultivate the talent needed at this level, and many workers aren't interested in staying around Pullman forever. Eventually, most of them move on, leaving Pitsilionis to find new candidates. On a personal level, Pitsilionis has seen firsthand the strain of trying to raise a family while owning a restaurant. From the age of 12, he worked in his family restaurant in Alaska. Now that he's thinking of starting a family, he's wondering how long he can keep up this level of hands-on involvement with Black Cypress. "Honestly, I hope we have a strong core group of people working at the restaurant that could take it over. When my main responsibility is to raise a child, I'd hope to be one voice among many at Black Cypress," he reflects. Even so, while the community is small, its members are loyal and supportive. The original print version of this article was headlined "In the Shelter of the Black Cypress"